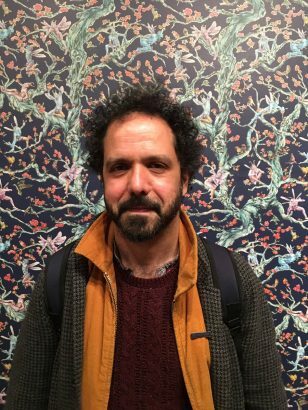 Poet Zaffar Kunial and painter Raqib Shaw share some common ground. Both have roots in Kashmir (Kunial through his father; Shaw by birth) and England (Kunial by birth; Shaw by virtue of having lived and worked here for over 20 years). But that is where they would at least seem to diverge. Shaw is famous for his opulent, vibrant renderings of paradises (his paintings drips colour), whereas Kunial is celebrated for its compression, intricacy, and focus “upon the small-scale mysteries of language”. As I walked to The Whitworth Gallery to hear Kunial’s poem written in response to Shaw’s work –commissioned by the Whitworth and MLF – the phrase about unstoppable forces and immovable objects came to mind. ‘Light on your lips’ stayed with me as Kunial began to read his commissioned poems, which, from the opening poem The Fourth Wall, emerged less as descriptions of paintings and more entrances into Kunial’s own layered worlds. With Shaw’s wallpaper imagining of ‘A Midsummer’s Night Dream’ as a backdrop, Kunial read The Fourth Wall, peeling back the layers of the wallpaper from his own childhood where “the future came in every once in a while…dark shades of yellow, prismatic as dust on butterfly wings”. Self Portrait as Bottom, the four part sequence Kunial read next (and written after Shaw’s painting of the same name) read like winding down a spiral staircase from the painting’s surface where “the artist (laughs) at me”, past the speaker’s face, to the basement floors where Shakespeare’s prose-speaking Bottom is a “mouth beyond shadows braying”, to the final poem where, in a genetic test’s results, the speaker hears “the numbers speak to (him) and feel like a thousand year stare/but numbers thousands of years ago didn’t end there”. Kunial closed with Bonsai – a blend of Kunial’s time spent at Shaw’s London studio, memories of his British grandfather’s begonias, and the body of the a bonsai tree: “I go back into the room of the needled stately pine/a trunk of wounded rings collecting/inches of each owner’s time”. Kunial thanked the audience; they showed their clear appreciation for his reading. The lasting sense here was of a fusion of process and form between the two artists. Shaw’s process is an active layering – from drawing, to acetate, to painting, stained-glass linings, and ornamentation; Kunial’s a work of peeling back layers, and unspooling of time from the immediacy of painting. Night’s like these feel worlds apart from the solemnity that can sometimes settle on poetry readings like a fine dust, and part of what makes the Manchester Literature festival special. Next to a gallery of ‘finished’ works, the reading had a sense of art-as-its-happening, the materials still warm and pliable. Kunial, in the reading and Q&A after, acted as a guide to his process and response to art, and lent the night a sense of intimacy and shared exploration. If you haven’t seen it yet, Raqib’s work is still at The Whitworth. And watch for Kunial’s debut. It promises marvels.